Sunflowers come in more shades than the just the common yellow. 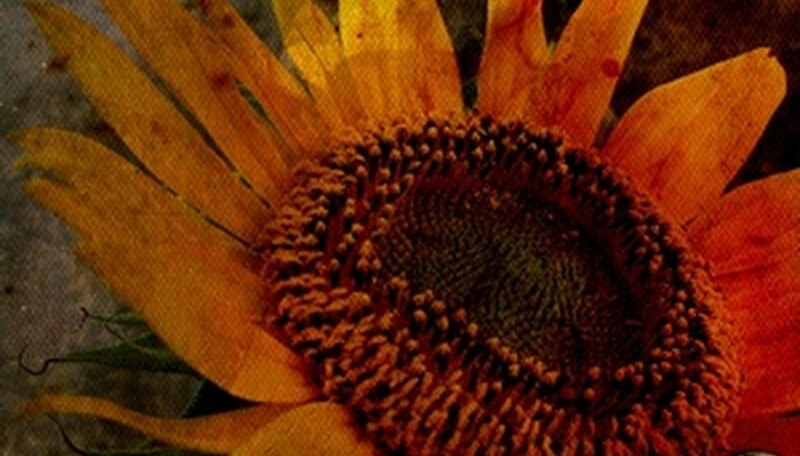 Deep red, pale orange and dark orange sunflowers are also available. Some sunflowers are only a few inches across while others have large blooms and double sets of petals, or rays. Preserving these summer flowers for year-round enjoyment is possible by carefully drying and preserving them. The dried flowers can be used in flower arrangements, alone or combined with other dried flowers and foliage. Choose a newly opened, healthy looking sunflower that doesn't have any damaged petals. Cut off the stem so only 1/4 inch remains attached to the back. Cut a 2-inch length of wire. Bend the top 1/2 inch of the wire into a hook. Push the long end of the wire into the center of the sunflower until it protrudes from the back and the hook is buried in the center of the sunflower, no longer visible from the front. This hook allows you to attach floral wire stems to the sunflower after drying so you can place it in arrangements. Place a 1-inch layer of silica gel, available from florists, in a plastic container. Use a container that has a tight-fitting lid, such as a food storage container. Lay the sunflower on top the silica gel, with the flower facing upward. Push the flower gently into the silica. Sprinkle silica crystals on top the sunflower, working them under and between petals with a toothpick so that the sunflower holds its natural shape. Add silica gel until the sunflower is completely covered. Place the lid on the container and seal it closed. Leave the sunflower in the mixture for two days. Remove the lid and brush the silica carefully aside to reveal the center of the flower. If the center is dry, the sunflower is ready. If not, leave it in the mixture for an additional day. Brush the silica gel off the top of the sunflower. Slide your fingers under the flower and carefully lift it out of the silica. Turn the flower upside down and tap the back so any excess silica falls out of the petals. Store the dried sunflowers in a sealed bag until you are ready to use. If you are drying more than one sunflower, leave a 1- to 2-inch space between them in the container. A mixture of one part borax and one part sand or oatmeal can be substituted for silica gel, but do not use a covered container with this mixture. If air can get in the container during drying, the silica will absorb the moisture from the air instead of from the flower, leading to improper drying. What Type of Stem Does a Sunflower Plant Have?